We specialise in producing high-quality videos for Golf Clubs and Resorts from ground-level footage of golfers in action to motion images filmed from the air. We also have the expertise to film the interiors of the clubhouse, Pro shop, restaurants and bars. For golf resorts we can also create video tours of the hotel rooms, spa and other guest facilities. 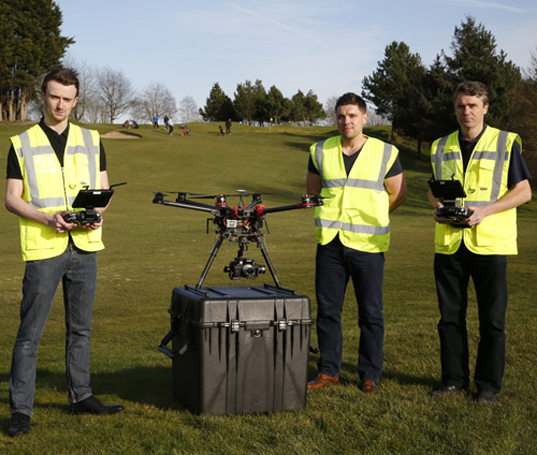 Creative Golf Video has a team of qualified drone pilots who are licensed with the Civil Aviation Authority, meaning we can legally provide aerial filming and photography services in the UK and a few countries in Europe. Creative Golf Video is a subsidiary of Creative Golf Design which has been designing golf courses since 1998, providing architectural design & consultancy services to over 100 golf courses throughout the UK and Europe. We understand golf courses and how best to show them off through broadcast quality 4K video footage. Our video team has over 15 years’ experience working in the TV industry, producing videos for commercial clients throughout the globe, ensuring that all our filming and editing is at the highest standards. A 2-minute video set to music featuring a montage of high-quality cinematic aerial video footage featuring the best holes and features of the golf course, combined with creative video filmed from the ground using our camera crane, gimbal and slider. It will open with an establishing aerial shot of the course, probably featuring the clubhouse, before leading into a montage of shots around the course mixed with footage of golfers teeing off, playing from bunkers or putting, and finish with a wide shot of the course with an animation of the logo superimposed onto the sky. Other techniques, such as time-lapse cinematography and slow motion images, may be used. This will leave a lasting impression on those who watch the video and encourage them to come and play. Individual aerial video flythroughs of each hole, starting with an opening shot from above the tee and flying from tee to green at a height of around 10 metres to highlight the best features of the hole. We would include some shots around the greens where there are features of particular note and work with your web designer to create a video playlist on Youtube which will be embedded into the club's website. In the basic packages these videos have captions and music, but there is an option for a Voiceover to identify the key playing features of each hole and some playing tips. The length and par of the hole from each tee marker can be overlaid on the video if required. This would be a short video using our camera gimbal for professional, smooth, walk-through footage, combined with our camera slider and camera crane to capture creative shots to give viewers an interesting video tour of the Clubhouse and Pro Shop, and it would include footage of staff working in the Pro Shop, behind the bar, in the restaurant and featuring the food and drinks available. Customer reviews and testimonials are great for marketing purposes and are a huge factor in influencing peoples’ spending habits when purchasing products online. Many will read product reviews or look through Trip Advisor when booking hotels and holidays and a visit to a golf club or resort can be sold in the same way. This video would feature a range of golfers on camera giving testimonials and telling the viewer what they love about the golf course and facilities will be a really effective marketing tool on the website. Further insights can be provided by interviewing the Professional Golfer, General Manager and other staff about the unique attributes of the golf course and facilities. For Golf Resorts with an on-site hotel, we will produce a stylish video tour which combines aerial footage of the outside of the hotel with camera gimbal stabilised filming of the internal spaces including the range of bedrooms available, bar facilities, restaurant, gym, spa, pool, entertainment on offer and anything else you would like to showcase. This would be a short video in the style of a TV infomercial, showcasing all the facilities and activities that would appeal to families and couples to market the golf resort as a destination. The aim of this video is to show that it offers something for the whole family by showcasing facilities that would appeal to children while also providing a high-quality golfing experience. It would include a voice-over narrative that will engage the viewer and highlight local tourism offerings. Ken has been designing golf courses since 1989 and launched Creative Golf Design in 1998. He has provided golf course architectural and remodelling services to over 100 golf courses around the UK and across Europe. He is a Senior Member and Past President of the European Institute of Golf Course Architects and Ken's knowledge of golf courses, and his experience in the golf industry, ensures that all video projects by Creative Golf Video are managed to the highest standards. Mark has been working in the TV & Media industry since 2002 and Launched Frozen Moon Productions Ltd in 2005. He has produced 1000's of videos for 100's of clients throughout the UK and across the globe. Mark has over 150 total combined Director/Producer TV credits for Fashion TV, Fitness TV and has produced a range of TV commercials for distribution on multiple TV channels around the globe. Mark's experience working with clients and many hours spent working with a vast range of cinematic cameras and equipment, ensures that all video projects by Creative Golf Video are filmed to TV broadcast standards. Sam has worked in the golf and construction industry since he left school in 2011 and has been with Creative Golf Design since early 2015. Sam has a great deal of flying experience and is our chief pilot for all our aerial filming work. His time working as a golf course greenkeeper helps us achieve quality fly-throughs with a smooth and safe operation. Sam prepares and plans the Pre-flight Site Surveys, mapping and detailing any hazards and risks to ensure that all our flying is done with safety in mind. Our S900 drone is a large multi-rotor machine which has a Zenmuse camera gimbal carrying a Panasonic GH4 camera with a wide angle prime lens. This ensures that all our aerial filming is stabilised and smooth. We film all our aerials in 4K resolution, which is 4 times the size of HD video. We have a bespoke Peli Flight Case for our S900, this enables us to take our drone and all other equipment safely onto flights for travel to golf courses around Europe. We use a high-end camera stabiliser for producing silky smooth walkthrough shots of hotels on golf resorts and also walkthrough shots of the clubhouse facilities and Pro-shop. This is the perfect tool to create cinematic smooth motion. It adds production value to all our videos and creates an effect like the viewer is flying around the internal spaces. Our camera crane is ideal for filming creative close-up shots of golfers and shooting camera ascents over tees and greens, with the camera rising to 5 metres, which is ideal for filming stylish slow motion shots. The camera slider is the ideal tool for shooting wide establishing shots with subtle movement and also great for filming internal shots of hotels and facilities to capture slow moving shots. We use a range of cameras for filming interviews and ensure that the audio is great through using wireless radio microphones. We have several of the latest 5K resolution 27inch iMac computers with the highest specification for efficient video editing.